It is rightly believed that the real beauty of India lies in the North east region. That picture perfect landscape, breathtaking views of the Himalayas, serene ambience, pleasing weather and diverse cultures of North East India attract tourists from all over the world. When talking of North East India, you can’t miss adding Darjeeling and Kalimpong to your list as they form two of the most popular tourist attractions. Our North India Tour Package- Darjeeling and Kalimpong Tour includes a visit to popular tourist attractions like Tiger Hill, Cable Car Ride, Ghoom Monastery, Natural History Museum, Hanuman Mandir and Peace Pagoda. On reaching New Jalpaiguri Railway Station (70 km) / Bagdogra Airport (65 km) / Tenzing Norgay Bus Stand (62 km), meet our IHPL representative who assists you while you take a transfer to your first destination, Darjeeling. Best known for housing Darjeeling Himalayan Railway, UNESCO World Heritage Site, Darjeeling is set at an elevation of 2050 meter. 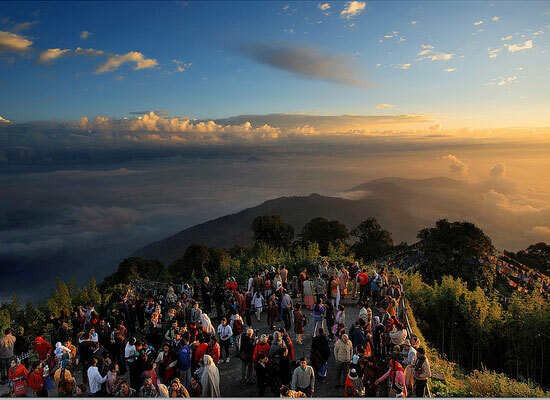 This beautiful hill station allures tourists from all over with its natural beauty and serenity. Darjeeling is one of the most traveled destinations of the India, because of the pleasant weather that prevails through the year. Check-in to the hotel and leave for a stroll around the mall or local shopping center in the evening. Stay overnight at Darjeeling. This early morning, start driving towards the famous Tiger Hill. Overlooking the Kanchenjunga Peak, the hill makes you enjoy a breathtaking sunrise that you will remember for a lifetime (Subject to clear weather). Located at a distance of 11 km from Darjeeling, Tiger hill is known to offer breathtaking views of the Kanchenjunga Peak during sunrise. While soft breeze caresses your face, you get to view the twin peaks of Kanchenjunga, changing their hues from pink to orange. 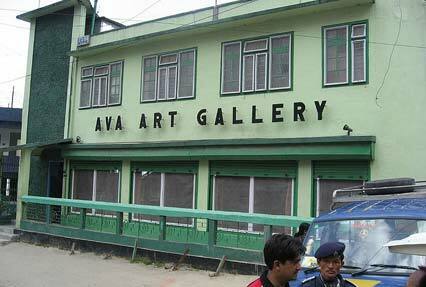 On your way back to Darjeeling, visit attractions like Ghoom Monastery, War memorial and Batasia Loop. 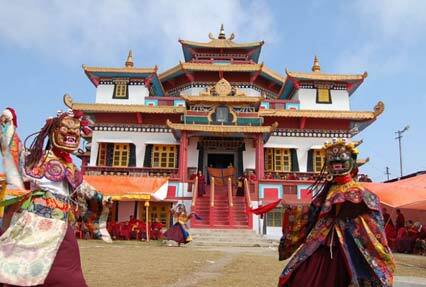 Set at a distance of around 8 km from Darjeeling, Ghoom Monastery is one of the most popular attractions of Darjeeling. The Gompa is considered one of the oldest Gompas in Darjeeling as it was found back in 1875. Also known as Yogachoeling Gompa, the monastery is known to house a number of bells, ornate thanka scrolls and drums. Later, visit War Memorial and Batasia Loop. Enjoy ride with Darjeeling Himalayan Railway that takes you through Batasia Loop, set in a loop-like pattern. The war memorial is located near the Batasia Loop and was built to commemorate the brave soldiers who lost their lives during wars after independence. After sightseeing at these locations, go back to the hotel and munch some healthy breakfast. Take some rest and then leave for your half day city tour covering attractions like Padmaja Naidu Zoological Park, Himalayan Mountaineering Institute (Closed on Thursday), Ropeway, Tensing Gumpo Rock, Tibetan Refugee Self Help Center (Closed on Sunday), Tea Estate, Natural History Museum (Sunday Closed) and Peace Pagoda. Awaken the mountaineering spirit in you with a visit to Himalayan Mountaineering Institute. Refresh yourself with a visit to the Tea Estate and pick up some of the best tea for yourself. Have a look at the beautiful peaks of the Himalayas with a cable car ride to Rangit Valley. 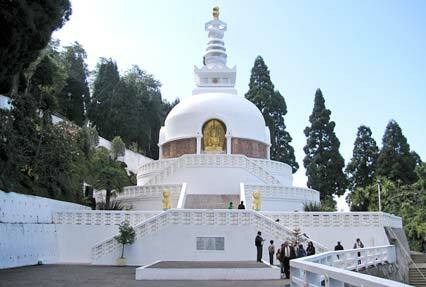 Peace Pagoda is a major attraction of Darjeeling which aims to unite people of all races and creeds for world peace. The place offers a spiritual and peaceful ambience to all the visitors. Return to hotel and go for a stroll around the area in the evening. Have a comfortable overnight stay at the hotel. Munch some healthy breakfast in the morning and then leave for Mirik (62 km). A beautiful destination set in the beautiful hills of Darjeeling, Mirik is known for its natural beauty and serenity. As you pass through scenic locations, capture some beautiful moments with your friends and family. The star attraction of Mirik is Sumendu Lake which is has a beautiful garden on one side and thick pine trees on the other. Enjoy your day amid its picture perfect gardens, tea plantations, orange orchards, cardamom groves and breathtaking view of the Himalayan ranges. Go for a horse ride around the lake. Also, you can enjoy boating at the lake. Feel close to nature in the serene and peaceful setting of the lake. Visit Pashupati Nagar Market and Shop for some cosmetics and clothes from Thailand. Later, head back to Darjeeling. In the evening, go for a walk around the mall or the local market area. Stay overnight at Darjeeling. This early morning, have your breakfast and then take a transfer to Kalimpong (49 km). A popular tourist destination in West Bengal, Kalimpong is a small hill station, known for its tranquility and scenic beauty. Kalimpong is a great destination for those who wish to escape from the hustle and bustle of the city and spend some time in peace. Set at an elevation of 1247 meter, Kalimpong offers spectacular view of the Himalayas and a green ambience to all the visitors. The place is a paradise for nature lovers because of its flower markets and horticulture. On reaching Kalimpong, check-in to the hotel. Later, leave for a sightseeing tour around Kalimpong and visit its major attractions like Forest Museum (Closed On Thursday), Deolo Hill, Hanuman Mandir, Dr Graham Homes, Durpin Monastery, Mangaldham and Pine View Nurseries (Cactus Only). 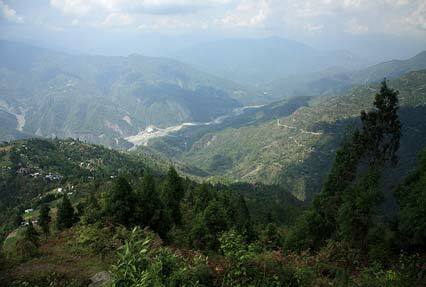 One of the major tourist attractions of Kalimpong, Deolo Hill is the highest point of Kalimpong. Deolo Hill is set amid a picture perfect landscape which makes it an ideal picnic spot. There is a beautiful garden with colorful flowers, which adds to the experience of visiting this attraction. After your sightseeing tour, head back to the hotel. In the evening, go for walk around the flowers markets of the place and interact with the locals. After having your breakfast, leave from Kalimpong to Siliguri / New Jalpaiguri Railway Station (71 km) / Bagdogra Airport (78 km) / Tenzing Norgay Bus Stand (65 km). On reaching, leave for your onward journey.